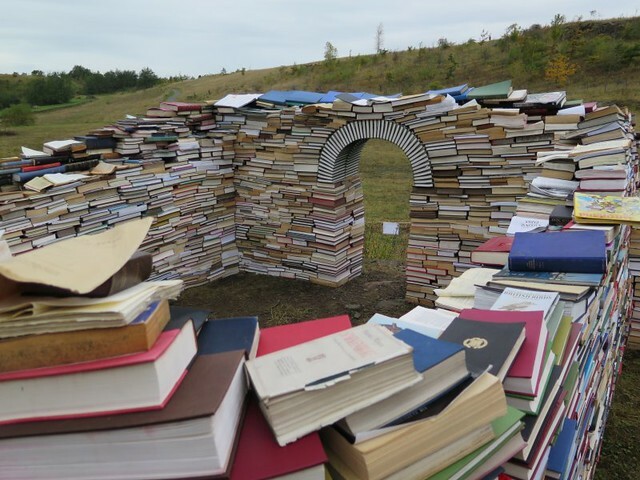 On our way home from Kendal, we made a detour up to the Wall to see the Milecastle built of books by artist Dawn Felicia Knox. The piece is called 'Simulacrum', and according to S., who knows about such things, is a reasonably accurate half scale model of a milecastle. The Hexham Courant quotes Lindsay Allason-Jones, who is, among other things, Chairman of the commissioning body, the Hadrian Arts Trust (they have a website, but it hasn't been updated lately). The idea, it seems, is to celebrate the introduction of literacy to Britain by the Romans. "It is because they did so that we know so much about Hadrian's Wall and those who lived here." 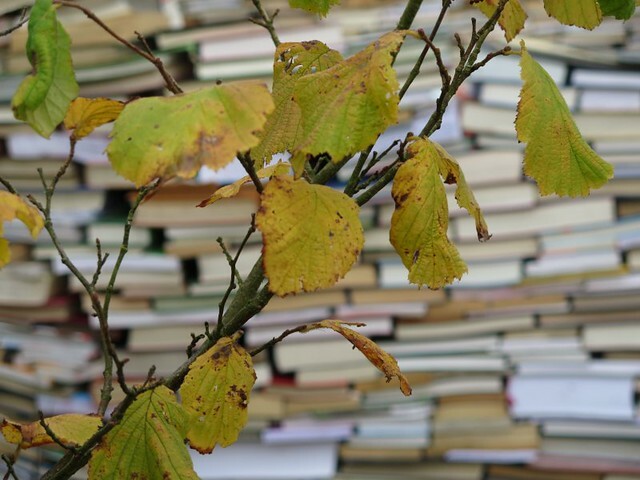 The books are a bit windblown, a bit battered, but most of them are perfectly serviceable. I had to be firm with durham_rambler: "Look, here's something by Jean Cocteau - Les... something..." " Les Enfants Terribles , we have a copy." (Do we? I'm pretty sure we do...). The literacy handed to us by classical antiquity has not composted down into our national psyche, it remains a defiantly undigested lump, the imposed culture of the colonial power. One last twist, though. Simulacrum is a scale model of a milecastle, but it's about the actual size of a turret; and it is situated in Walltown Quarry where turret 45B is, in fact, missing, destroyed soon after 1883 by the operations of the Greenland Quarry. Because the Victorians may have placed great value on a classical education, but they weren't going to let that stop them quarrying this useful rock. I've been loving your fall foliage pictures; but we, too, have good colours this year! There is a copy of the Ladybird 'British Birds' on the top layer. 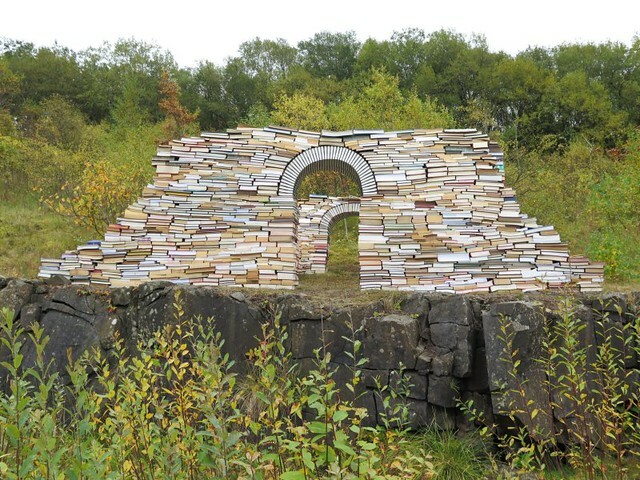 This is a bibliophile's worst nightmare! People living near Hadrian's Wall have, throughout the centuries, robbed it to provide building stone for their own homes and buildings. So surely it is an entirely appropriate response to this artwork to remove books from it in order to furnish ones own home? We collect Ladybirds although the history ones mostly. No plans to revisit - it would be cool to drop by regularly and check progress, but it's a long way. I could try to find out whether they intend just to leave it there and let nature take its course, or whether they plan to remove it. Oh, the Stonyhurst Gospel - yes, it was found in St Cuthbert's coffin. It's now in the BL, and a beautiful book: the text is just plain, nothing fancy like the Lindisfarne Gospels, but so clearly written. They tend to display the binding these days, so you fon't get to see the pages.